When my wife was pregnant with Arya she was deluged with advice from friends and family. Multiple mothers recommended we get a specific book that helped them through their pregnancies. The book, What to Expect When You’re Expecting by Heidi Murkoff and Sharon Mazel, is the best selling pregnancy book of all time. At 614 pages, it is also the longest pregnancy book available on the market. 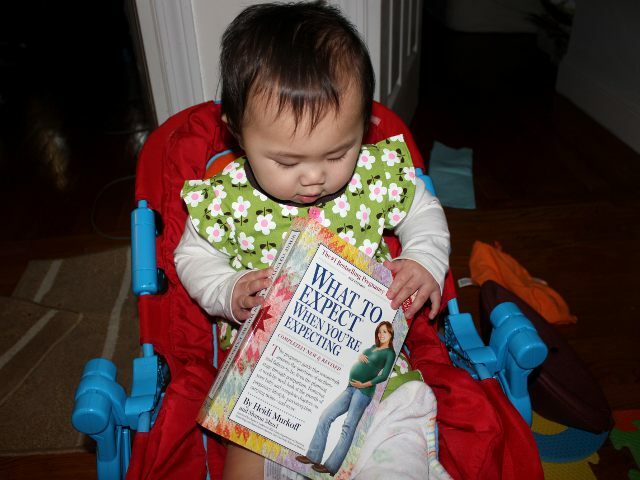 With more than 14 million copies of the book in print, there are thousands of online reviews of all editions of the What to Expect When You’re Expecting. Most reviews are split along extremes with reviewers either loving or hating the book. While the authors do emphasize that no amount of alcohol is safe for a fetus, they dilute the message with the preceding statement about lack of evidence. Why, if there is no evidence that alcohol can harm a developing embryo, does every major medical organization strongly advise against drinking while pregnant? The conflicting tone continues throughout the book with many sections consisting of warnings about the negative consequences of less-than-perfect pregnancy behavior combined with uplifting statements designed to make mothers not worry. It is understandable that the authors did not want the entire book to simply be filled with admonitions of what to do and not do. However telling pregnant women not to worry about their bad choices likely serves to make women worry even more. In spite of valid criticism, I still consider What to Expect When You’re Expecting to be the best pregnancy book that my wife and I have ever read. Two major points render the book better than its competition. First, the book is an incredible value. With 23 chapters and 614 pages, the book covers every aspect of pregnancy with discussion of even rare outcomes. Nonetheless, at a full retail price of under $15 it is one of the cheapest pregnancy books of any length. If pregnant women gain even a single useful tip from the book it becomes well worth the price. Second, the book serves as a great starting point for in-depth analysis of any issue related to pregnancy. For example, the section about weight gain during pregnancy provides clear guidelines regarding when a women should contact her physician. Rather than trying to apply a one-piece-of-advice formula for all women, What to Expect When You’re Expecting directs women to gain more information at the appropriate time. Even though a large minority of sections–ranging from peanut allergies to belly piercings–had no bearing on my wife, we were both comforted at the thought that we could reach for one text to look up our pregnancy-related questions. Comprehensive coverage of pregnancy combined with its great value makes What to Expect When You’re Expecting a must-have book for all expectant mothers. What to Expect When You’re Expecting is one of a long list of other books concerning pregnancy and parenting. The What to Expect brand has recently been expanded to include an online website filled with resources. The site, Whattoexpect, also uses the same formula as the book series with a combination of research anecdotes and straightforward advice. What to Expect When You’re Expecting costs (including shipping) under $9 new and under $7 used from Amazon.